In the attempt to make the Dart project accessible to anyone, a SINGLE SKETCH is provided. It will automatically be able to adapt to the chosen Arduino board and to different types of controllers to be implemented. Thanks to the AUTODETECT function the system is ready to handle buttons and knobs, immediately after uploading. All the libraries needed are included in the sketch folder and are automatically loaded. The MIDI-over-USB function will be immediately active after loading the sketch on the Arduiono Leonardo boards, Arduino UNO R3 boards will require a litte hack to enable it. 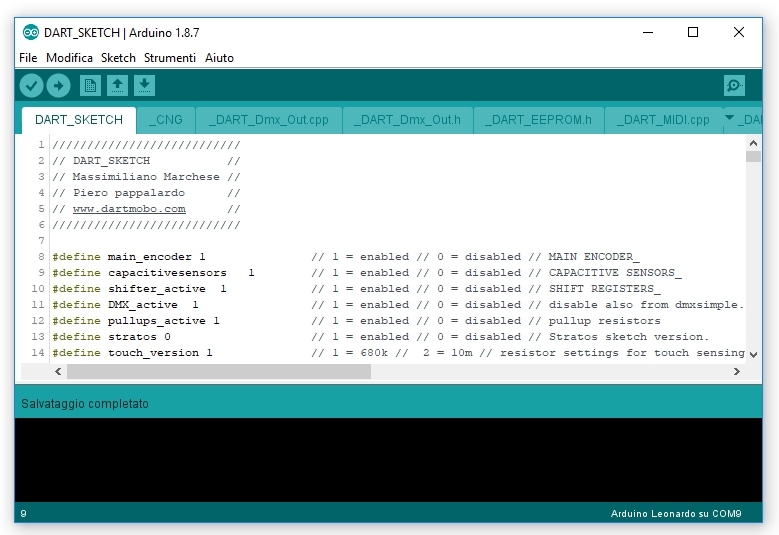 The first screen of the sketch, when loaded through the Arduino IDE (see illustration above) offers the possibility to disable some features of the Dart framework, for those who want more memory to insert custom code. The controller setting will be done without having to touch the code, through a convenient editor. some tips for those who want to go into the code will be provided later. For the moment we recommend following the comments in the sketch. The Dart_sketch comes with all the features activated (including, for example, the DMX output functionality). For this reason the Arduino IDE will report that almost all memory is used. The sketch will still work, but for those who want to add custom code, we recommend disabling unused features. This operation can be performed from the main page of the sketch.